"I suppose pilots are as good now as they ever were, but they sure don't live the way we did." Hollywood veteran Robert Aldrich directed some of my favorite 1960s films, including Hush, Hush Sweet Charlotte, Whatever Happened To Baby Jane? and The Dirty Dozen. The Flight of the Phoenix is his superb 1965 adaptation of Elleston Trevor's taut novel, and it, too, stands as one of those timeless films that I could watch over and over anytime it showed up on television. When a cargo plane carrying a mix of oilfield workers and military men crash lands 130 miles off course in the Sahara, a battle of wits and power develops as the survivors have to determine not only how to stay alive, but how to get along as water becomes scarce and the chance of rescue diminishes. Much like an adult version of The Lord of the Flies, this is the story of a disparate group of characters forced to find common ground and organization in order to survive under harsh conditions. 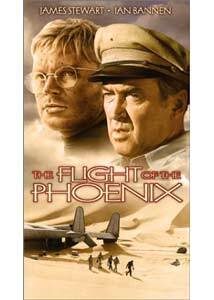 The plane's pilot is Captain Frank Towns (James Stewart), an aging aviator who believes the best course of action is to sit tight and wait for help; British military officer Captain Harris (Peter Finch) wants to lead a small expeditionary force across the desert, while Dorfmann (Hardy Kruger), a German aeronautical designer, has an even more daring and adventurous plan. The Flight of the Phoenix is really a tense multi-level character piece, driven by an outstanding ensemble cast, that in addition to great performances by Stewart and Kruger, includes endearing and memorable turns by Richard Attenborough, Ian Bannen and Ernest Borgnine. As tensions rise, as their predicament becomes more increasingly more grim, the constant interaction between the players is what makes Aldrich's film so rewarding. The inevitable power struggle between concerned Towns and the coldly realistic Dorfman is one of the strongest elements in the story, and watching a film icon like Stewart get repeatedly humbled and beaten down mentally goes against the usual "the hero is always right" way of thinking of most old-time Hollywood lead actors, and in fact it is Kruger's Dorfman who may or may not ultimately be the group's salvation. Stewart's Towns and Attenborough's stammering Lew Moran go toe-to-toe on a number of occasions, and their bitter exchange late in the film again shows Stewart in a rather ugly light, made all the more poignant by Attenborough's haunted reactions. Even with the first-rate cast and performances, Aldrich's film does run long, clocking in at a whopping two hours and twenty minutes, which is quite long considering 90% of the film consists of characters bantering back and forth, and very little in the way of formidable action. The almost leisurely pacing by Aldrich does work exceptionally well more often than not, though a handful of segments appear to meander unneccessarily. Patience, however, is a virtue, because the film's big dramatic payoffs are more than well worth the wait. Image Transfer Review: Presented in 1.85:1 anamorphic widescreen, Aldrich's The Flight of the Phoenix certainly does not look like a film pushing forty years old. While there are some visible specks and nicks, by and large the transfer looks wholly impressive. Though the entire film takes place in the desert, the color palette is surprisingly deep and well rendered (just take a look at the blues of the sky), as are the realistic fleshtones. Image detail is not razor sharp, but remarkably clean for a film this old, and the clarity of the beads of sweat on the actor's faces is reproduced especially well. Audio Transfer Review: Fox has issued an optional English stereo track for this release, along with the original English mono mix. Call me a purist, but I found mono to be a more even presentation, as the new stereo mix, while noticeably fuller, seemed to somehow bury the dialogue slightly. Flipping back and forth between the two choice, I noticed that dialogue seemed cleaner and less "enhanced" in mono. Some of the odd bursts of the Frank De Vol score tend to clip a bit on both tracks, but for consistency I would recommend the mono option. French and Spanish mono tracks are also included. Extras Review: Shame on Fox for not including anything more than just three theatrical trailers (in English, Spanish and Portuguese). The disc is cut into a healthy 36 chapters, and does include subtitles in English, Spanish and French. Robert Aldrich's desert castaway classic gets an alarmingly bareboned treatment from Fox, but the film is so good that I can almost forgive them. A stellar cast and an unusually inventive story make this an easy recommendation.